Buy direct from THINBIT. 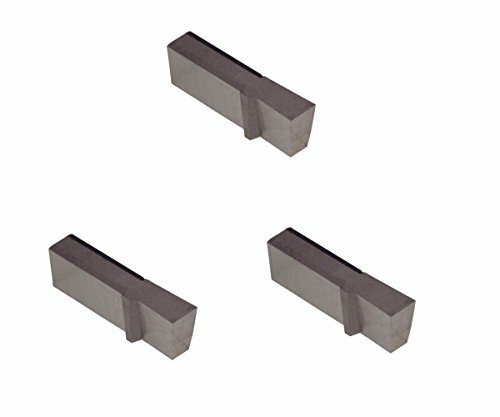 3 Pack LGT110D2R, .110" wide GROOVE 'N TURN 'L' series grooving insert. Sharp Corner, 0 radius. .250" depth of cut. Uncoated carbide. DURA-MAX® 2000 is a versatile and tough sub-micron grain carbide. Because of its high transverse rupture strength and fine grain structure, DURA-MAX® 2000 performs well with interrupted cuts. This grade is recommended for cutting steel, cast iron and stainless steel. Kaiser Tool Company, Inc. makes all products in Fort Wayne, Indiana and has over 50 years producing THINBIT® products. Our principles are Quality Products, Fast Delivery and Superior Customer Service. Please Note: Final shipping costs will be calculated at checkout based on value of all THINBIT items ordered. THINBIT, GROOVE 'N TURN and DURA-MAX are registered trademarks exclusively licensed to Kaiser Tool Company, Inc. in the U.S. and/or other countries. See Downloads section below item photos for detailed product information, technical information and compatible toolholders. Cuts up to .250" deep. Can be used for parting stock up to .500". Cuts flush to collet face or shoulder of larger diameter. Designed for grooving and multi-directional turning. Use to generate grooves, arcs and angles. Uncoated DURA-MAX® 2000 carbide grooving insert for steel, cast iron and stainless steel with interrupted cuts. Use with 'L' series toolholders. Use RH straight or LH 90 degree. Manufacturer: Kaiser Tool Company, Inc. Publisher: Kaiser Tool Company, Inc. Studio: Kaiser Tool Company, Inc. If you have any questions about this product by GROOVE 'N TURN, contact us by completing and submitting the form below. If you are looking for a specif part number, please include it with your message.